Donald Trump has promised to build a wall separating the United States from Mexico. Its purpose: To stop the oncoming waves of illegal immigration from that country–and other poor, strife-torn nations in Central and Latin America. The United States/Mexican border stretches for 1,954 miles–and encompasses rivers, deserts and mountains. Drug traffickers and smugglers could easily tunnel under it into the United States–as they are now doing. But there is another way that, as President, Trump can attack illegal immigration: By attacking the “sanctuary cities” across the nation that illegally shield violators of Federal immigration laws from arrest. This would prove far cheaper and more effective than building a wall along the entire U.S.-Mexican border. These cities have adopted “sanctuary” ordinances that forbid municipal funds or resources to be used to enforce federal immigration laws, usually by not allowing police or municipal employees to inquire about one’s immigration status. All Trump has to do is cut off Federal funding to those cities which systematically defy the immigration laws of the United States. And on March 27, his attorney general, Jeff Sessions, threatened to do just that. His reference was to a Federal law which says cities cannot prevent federal authorities from enforcing immigration laws. Trump has never held public office, and there is much he has to learn about the difficulties of carrying out his programs. But his experience as a businessman has given him a solid feel for the power of greed and selfishness. And he knows well how to exploit both. At first, many–perhaps most–of the people living in “sanctuary cities” will rush to support their elected officials in refusing to knuckle under. First they will aim their rage at the local–and elected–officials of these cities responsible for “sanctuary” policies. And then they will focus their anger on the illegal aliens being protected by civic officials. This will be followed by increasing demands by legal–and law-abiding–American citizens for their elected officials to cooperate with Federal immigration agents. And those citizens who feel conscience-torn by demanding an end to “sanctuary cities” will console themselves with this literal truth: Illegal immigration is against the law–and local officials have a sworn duty to obey the law at all levels–including those laws they don’t agree with. Donald Trump has promised–or threatened, depending on your viewpoint–to build a wall separating the United States from Mexico. And that is precisely what he has threatened to do. One such city is New York, which could lose up to $10.4 billion in Federal funding. Among the city agencies that receive the biggest share of these monies: The New York City Housing Authority, the Administration for Children’s Services and the Department of Social Services. Mayors from other “sanctuary cities”–such as Chicago, Baltimore and San Francisco–have similarly echoed de Blasio’s sentiments. Legal United States citizens won’t be able to obtain assistance allowing low- and moderate-income families to rent housing in the private market. American children needing care for their mental, emotional or medical needs will be denied it. Americans wanting to adopt a child in foster care will be unable to do so, because the monies won’t be there to pay the officials who now staff these agencies. Illegal immigration is against the law. And local officials have a sworn duty to obey the law at all levels–including those laws they don’t agree with. In the end, Trump will almost certainly win his battle on this. And his victory will give him confidence to press on with the rest of his agenda. Drug traffickers and human smugglers could easily tunnel under it into the United States–as they are now doing. As District Attorney for San Francisco (2004-2011 Kamala Harris created a secret program called Back on Track, which provided training for jobs that illegal aliens could not legally hold. She also prevented Immigration and Customs Enforcement (ICE) from deporting even those illegal aliens convicted of a felony. It is not the duty of local law enforcement, she said, to enforce Federal immigration laws. Harris is now California’s Attorney General and will soon be its U.S. Senator. (4) CEOs whose companies–like Wal-Mart–systematically employ illegal aliens should be held directly accountable for the actions of their subordinates. This would prove a more effective remedy for combating illegal immigration than stationing tens of thousands of soldiers on the U.S.-Mexican border. CEOs forced to account for their subordinates’ actions would take drastic steps to ensure that their companies strictly complied with Federal immigration laws. Without employers’ luring illegal aliens at a fraction of the money paid to American workers, the flood of such illegal job-seekers would quickly dry up. If they’re not here legally at the time of their birth, they should not be considered citizens and should–like their parents–be subject to deportation. The Mexican Government doesn’t hesitate to apply strict laws to those immigrating to Mexico. And it feels no need to apologize for this. (7) Voting materials and ballots should be published in one language–English. Throughout the United States, millions of Mexican illegals refuse to learn English and yet demand that voting materials and ballots be made available to them in Spanish. There is no reason to cater to their hypocrisy. (8) The United States should vigorously counter the argument that deporting illegal aliens “separates families.” There is absolutely no reason why this should happen. Those American citizens who wish to do so are perfectly free to accompany their illegal relatives to their home countries. 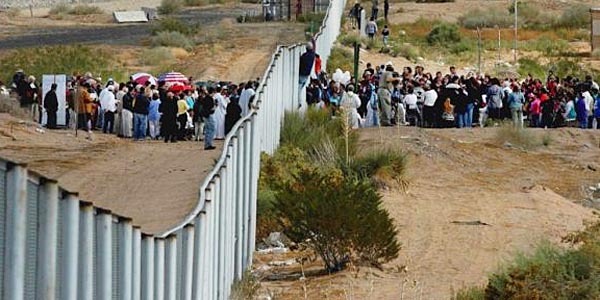 (9) The United States should impose severe economic and even military sanctions against countries–such as China and Mexico–whose citizens make up the bulk of illegal aliens. Such nations must learn that dumping their unwanteds on the United States now comes at an unaffordably high price. Otherwise those dumpings will continue. The United States/Mexican border stretches for 1,954 miles–and emcompasses rivers, deserts and mountains. (1) The Justice Department should vigorously attack the “sanctuary movement that officially thwarts the immigration laws of the United States. In San Francisco, for example, former District Attorney Kamala Harris—who is now California’s Attorney General—created a secret program called Back on Track, which provided training for jobs that illegal aliens could not legally hold. Upon conviction, the CEO should be sentenced to a mandatory prison term of at least twenty years. This would prove a more effective remedy for combating illegal immigration than stationing tens of thousands of soldiers on the U.S./Mexican border. CEOs forced to account for their subordinates’ actions would take drastic steps to ensure that their companies strictly complied with Federal immigration laws. Without employers luring illegal aliens at a fraction of the money paid to American workers, the flood of such illegal job-seekers would quickly dry up. In Mexico, voting materials are published in one language–Spanish.